Neil Armstrong getting equipment form the Lunar Module "Eagle" on the surface of the moon. 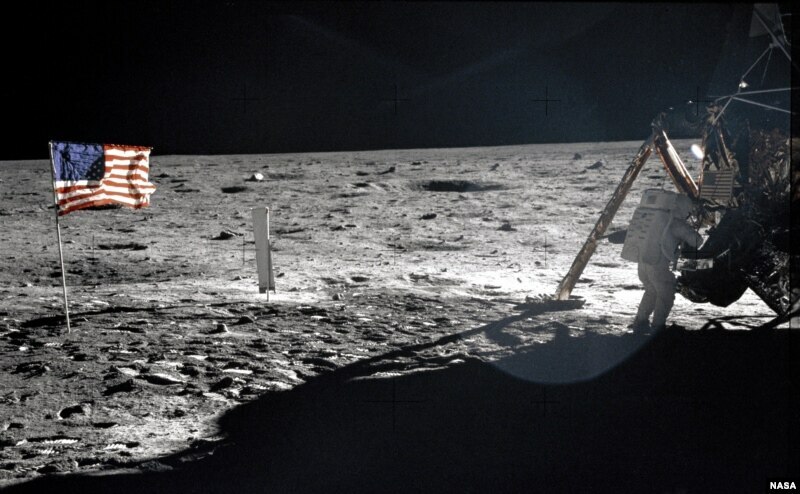 The picture was taken by Buzz Aldrin. JUNE SIMMS: Welcome to AMERICAN MOSAIC in VOA Special English! I’m June Simms. This week, we hear about a new book on natural soundscapes and the man who recorded them. We also tell about singer Kris Allen and how he chose a name for his new CD. But first, we tell about Neil Armstrong, the first man to walk on the moon. This week, people around the world have been remembering the former American astronaut Neil Armstrong. He was the first man to walk on the moon. He died last Saturday in his home state of Ohio. He was eighty-two years old. He and Aldrin spent nearly three hours walking on the moon. Weeks later, the two men and Michael Collins, the third member of the Apollo 11 crew, were honored with huge parades in New York City, Chicago and Los Angeles. They later traveled around the world to share information about their trip to the moon. The Apollo 11 mission earned recognition from seventeen nations and many special American honors. They included the Presidential Medal of Freedom, the Congressional Space Medal of Honor and the American space agency’s Distinguished Service Medal. Some historians say the moon walk marked America’s victory in the space race with the Soviet Union. In later years, Neil Armstrong served as Deputy Associate Administrator at the space agency’s headquarters. He was also a professor of aerospace engineering at the University of Cincinnati in Cincinnati, Ohio. He and his family lived on a farm just outside of the city. In recent years, Armstrong had largely withdrawn from public life. But he spoke earlier this year at an event at Ohio State University. The event honored former astronaut and senator, John Glenn. JUNE SIMMS: Bernie Krause records Mother Nature. During the past 40 years, he has gathered four thousand hours of natural soundscapes. These include the voices of fifteen thousand species. But about half of these sounds can no longer be heard because of noise pollution and human activities. As we hear from Faith Lapidus, Bernie Krause’s new book documenting Earth’s great voices, was written in an effort to save them. FAITH LAPIDUS: The Earth sings. Just listen. Whether it is a rain storm, the cry of a wild animal or an engine starting up against the winter silence, Bernie Krause has recorded it. He says these voices are combined together into a kind of tapestry, or artwork. His book is called “The Great Animal Orchestra.” Bernie Krause says what he found was not so much the sound of a single voice, but instead a collection of voices. The ones that interest him most are in areas near the equator, and in rainforests and deserts because they are so structured. In the book, he takes readers to the heart of the Amazon rainforest of Brazil. Just after he set up his recording equipment and sat down about nine meters away, he heard the sound of a jaguar. The big cat had stepped right up to the microphone and, like a great singer, began to growl into the device. ​​BERNIE KRAUSE: “There it was establishing its own niche and territory vocally.” Bernie Krause has recorded sounds on every continent. His collection includes such unusual voices as mating gibbons at sunrise in Indonesia, and the whistle-like song of the Musical Wren from Peru. But creatures like these are under threat from urban development and a changing climate. Mister Krause has documented changes in the Sierra Nevada Mountains of California. In nineteen eighty-eight, a logging company announced plans to remove a few trees from an area called Lincoln Meadow. The company said the tree removal project would have no effect on wildlife in the area. Bernie Krause was given permission to record the soundscape before the project began. He says workers removed only a few trees from Lincoln Meadow. Since then, he has returned to the area fifteen times in the past fifteen years. Yet the sound still has not come back to the way it was. While soundscapes are disappearing in some areas, Bernie Krause sees hope for others. They include areas like Chernobyl, where a nuclear accident took place in nineteen eighty-six. Here is a recording made twenty years later. Bernie Krause says his soundscapes are a call to protect wild places. He says human activities have a great effect on the natural world. And unless we pay attention to its creatures, we will silence Mother Nature’s Great Animal Orchestra. I’m Faith Lapidus. JUNE SIMMS: “American Idol” winner Kris Allen released a new CD earlier this year. "Thank You Camellia" is his second CD since winning the singing competition in two thousand nine. He says his life has changed a lot since then. He now makes music for a living, travels a lot and has many fans. And then, of course, there is Camellia. Exactly who is this mystery girl named in Kris Allen’s new album? Christopher Cruise has more. ​​CHRISTOPHER CRUISE: The “American Idol” winner denies that “Thank You Camellia” is named for a girl. He says Camellia is instead a street in Los Angeles where some of his friends let him live while he was recording songs for the new CD. He slept at their house on and off for almost a year. The twenty-seven year old star says it was nice to enjoy the warmth and comfort of friends, instead of going all alone to a hotel every night. He wanted to thank his friends for their support so he named the album after them. “The Vision of Love” is the first song from the album. It was a Top Forty hit. JUNE SIMMS: I’m June Simms. Join us again next week for music and more on AMERICAN MOSAIC in VOA Special English.